More than half of England's secondary schools, 54%, did not offer GCSE computer science in 2015-16, a report from the Royal Society has found. It urged the government to increase spending on computer education tenfold over the next five years to ensure youngsters can "unlock the full potential of new technologies". The biggest issue was the lack of skilled teachers, the report found. The Department for Education said more pupils were choosing the subject. "We want to ensure our future workforce has the skills we need to drive the future productivity and economy of this country and that is why the government made computing a compulsory part of the national curriculum," said a spokesperson. "Computer science GCSE entries continue to rise more quickly than any other subject. "We recently saw an increase in entries to Stem subjects [science, technology, engineering and maths] for the English Baccalaureate (EBacc) and the number of girls taking Stem subjects at A-levels has increased by over 17% since 2010. "Since 2012, the department has pledged £5m to the Network of Teaching Excellence in Computer Science programme, which has built a national network of nearly 400 computer science specialists (who) schools can commission to provide bespoke training for their teachers." The Royal Society, the UK's independent scientific academy, is concerned about how the lack of computing expertise will affect the future workforce. 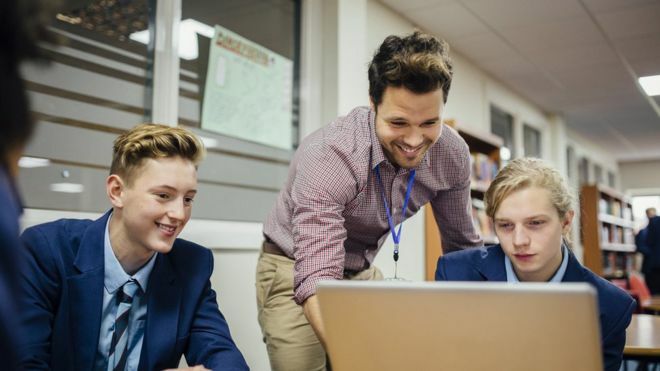 Prof Steve Furber, who worked on the report, said: "Computing teachers have told us that they feel the government rushed in a new curriculum without giving them the support or money to deliver it. "The report paints a bleak picture in England, which meets only 68% of its computing teacher recruitment targets and where, as a result, one in two schools don't offer computer science at GCSE, a crucial stage of young people's education." He added that, "overhauling the fragile state of our computing education" would require an ambitious, multipronged approach. This report highlights what some teachers have been telling me for a while - that the revolution in computing education in the UK has stalled. Five years ago a head of steam built up behind the idea that children needed to be taught coding and that the ICT GCSE was not fit for purpose, teaching little more than how to use Microsoft Office. The government responded by taking ICT off the National Curriculum and replacing it with computer science. But this course is proving far more demanding of both pupils and teachers, and many schools have decided that it is just not worth the bother at a time when resources are tight. Some ICT teachers who had always argued that it was a practical course, attractive to a far wider range of children, are now saying "I told you so". But across the world of computing education there's agreement on one thing - more money needs to be spent on training teachers in this vital subject. Prof Furber's views were echoed by technology firms Microsoft and Google, who are both working to increase computer skills among schoolchildren. Google's UK managing director Ronan Harris said: "There is still much more to do to ensure young people across the UK have access to computer science education. "Whatever school they attend or whatever field they plan to go into, every student should have the opportunity to understand the principles and practices of computing." And Microsoft's UK chief executive Cindy Rose said: "The risk, if we don't make these investments now, is that too many young people struggle to access new opportunities and the UK loses its advantage in a world being transformed by technology."